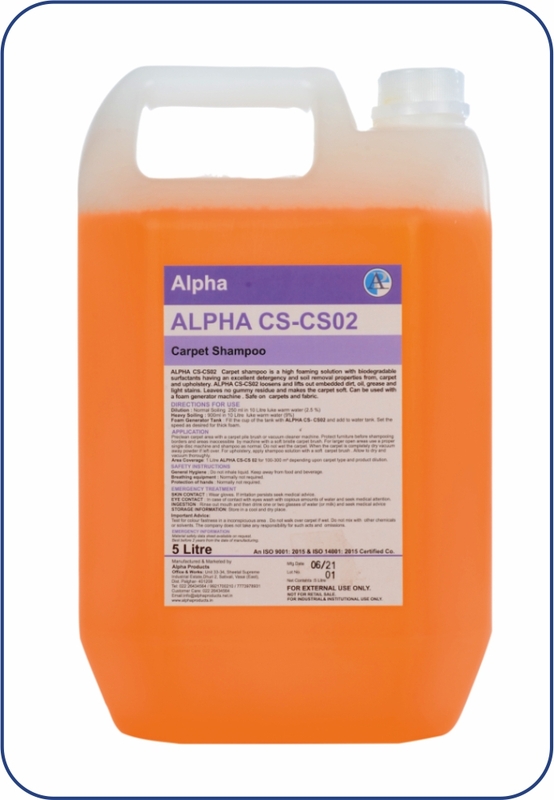 ALPHA-CS- CS02 Carpet Shampoo is a high foaming condensed lather-cleaning action for effective soil penetration. ALPHA-CS-CSO2 has excellent detergency and anti-static properties. ALPHA-CS- CS02 loosens and lifts out embedded dirt, oil, grease and stains. Leaves no gummy residue, and makes the carpet soft. It can be used in foam generator machines. Safe for fibres. Use with carpet shampoo/foam generator machine and then vacuum to remove dust. For sensitive skin, use gloves.